JEJUDO ISLAND ― Minutes after the bus drifted down a tote road toward the shore, a glassy cobalt blue ocean unfolded menacingly, with two newly paved, sprawling breakwaters being occupied by a small fleet of naval ships including an Aegis-equipped destroyer and submarines. 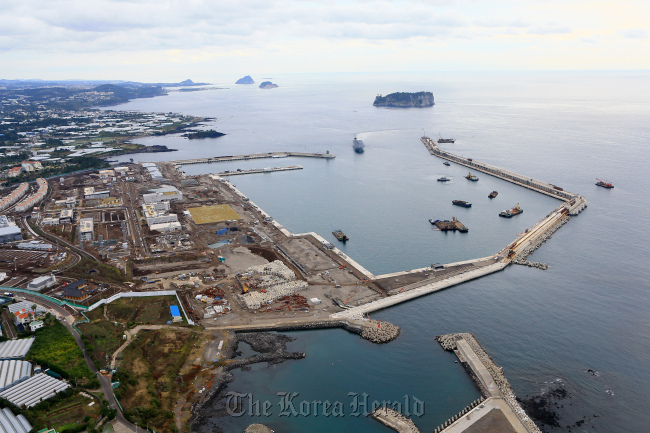 Following several years of protests and subsequent delays, the Navy is gearing up to introduce a strategic naval base on this scenic island as early as January as part of Seoul’s efforts to shore up its maritime defense. A captain-led unit is forecast to be launched on Dec. 1 to defend the base together with the Navy’s 7th Task Flotilla and part of the Submarine Force Command, which will move to the island from their current headquarters in Busan and Jinhae, South Gyeongsang Province, respectively. When their relocation completes, the base will be home to more than 3,000 seamen and their families, the Navy said. The compound, which straddles a more than 490,000-square-meter area in the southern town of Gangjeong, is also envisioned to serve as a commercial port capable of housing two 150,000-ton cruises at the same time in addition to 20 warships. “Located at the heart of the waters surrounding the peninsula, the base will become a strategic foothold and hub for naval power where we can quickly dispatch forces to the front line and disperse them more easily, while fending off North Korea’s possible penetration and protecting maritime transportation routes and major harbor facilities,” said Capt. Lee Gil-ju, the manager of the construction management team. The 1.02 trillion won ($886.4 million) project was first floated by the Joint Chiefs of Staff in 1993 and initiated in 2007. With about 94 percent of construction currently completed, an opening ceremony will take place in late January or early February, Navy officials said. With the new installation, a warship can now reach the submerged rock of Ieodo within around four hours, nine hours faster than when deployed from the existing base in Busan, they say. The times required to approach other possible flashpoints, such as Dokdo, claimed by Japan, and the Northern Limit Line, the de facto maritime frontier with North Korea, will also shorten by several hours. Ieodo has for years been a source of diplomatic spats between Seoul and Beijing as it lies in the intersection of the two nations’ exclusive economic zones. The ambitious initiative, however, has been suffering a series of setbacks due chiefly to years of intense protests by activists and villagers who unsuccessfully tried to thwart the base construction through a lawsuit on concerns over potential environmental degradation and militarization of the area. A separate two-year work for a cruise terminal, initially slated to end in May 2017, has not even started yet due to the resistance of some residents. The focal point was the proposed destruction of the “Gureombi” indigenous volcanic rock, which provides a habitat for endangered species such as striped shore crabs and narrow-mouthed toads. Navy and Jeju provincial and city government officials have since intensified efforts to minimize potential environmental damage by holding rounds of consultations with opponents, conducting regular ecosystem monitoring and creating a waterside park inside the base with the unscathed Gureombi rock. Though much of the uproar has subsided, some protesters led by the Catholic Solidarity for the Realization of the Jeju, Peace Island, continue to celebrate a Mass every day at 11 a.m. in front of the entrance of the site in protest of the work. Concerns persist that the fault line between the military and the community may well deepen as the Navy is preparing to exercise its right to indemnity to make up for extra expenses totaling nearly 50 billion won ($43.2 million) caused by years of demonstrations and resulting construction delays. 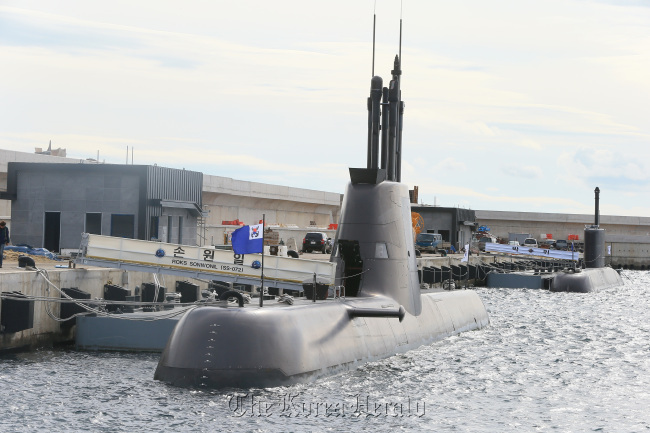 Navy officials plan to raise a suit early next year after specifying defendants and concluding the arbitration processes with the contractors, Samsung and Daelim, respectively, in consultation with the Justice Ministry, they said. “Unfortunately we have no discretionary power with regard to the indemnity litigation whatever, because this is a matter of law enforcement. Our efforts to reconcile with society and the indemnity right are different pairs of shoes,” a senior Navy official told reporters.